On-The-Go Game Pad - no batteries required! On-The-Go Game Pad – no batteries required! Living out in the country, we’re a family of road trippers. Whether holidaying or appointments in the city, it usually involves several hours in the car to get to our destination and along the way I need to be a one-mum-band of on-the-go entertainment. 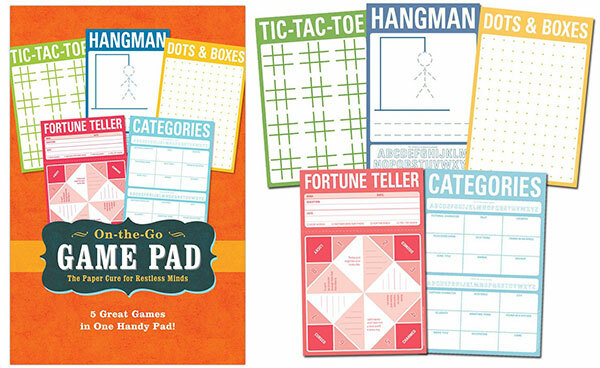 Yes, I definitely need these travel games in my arsenal! Perfect for travelling or even handy for when you’re stuck waiting, children will be entertained no matter where they are with an On The Go Game Pad from Knock Knock. It’s never been easier to rip into a game of hangman or fortune teller, with 60 perforated sheets spread across five varied games. Good old fashioned paper and pen is all that’s needed and while a young child can partake in some tic tac toe action, most of the games are a little trickier so are aimed at the seven-year-old age group and above. Whether you want one to pop into your handbag or keep one in the glove box of your car, you can find them at Knock Knock, priced US$9.